"One of them was a particularly fine type of Arunta, ~ he impressed me with his splendid air of independence." Errol Coote, Hell's Airport. 139. Known as 'Jacky' in Ion Idriess's 'Lasseter's Last Ride' and 'Ralf' in Blakeley's 'Dream Millions'. Rolfe Entata had considerable involvement in the first C.A.G.E. Expedition and his observations on the Expedition members and organisation would have been enlightening....if anyone had bothered to ask him. Entata was introduced to the Expedition at Illbilla waterhole on 31/08/30, at the time he was travelling with Paul Johns and another Aboriginal and five camels, ostensibly on a dogging trip, that is hunting dingoes for the bounty. Johns and his helpers had been forced into Illbilla due to lack of supplies and water. Johns' suspiciously convenient arrival proved a blessing for Blakeley and Lasseter, Johns and his Aboriginal guides now provided a second option to extend the search for Lasseter's reef if the Thornycroft failed to traverse the difficult country south of Illbilla, and Entata became the Expeditions temporary interpreter, conversant in several Aboriginal languages and dialects. Blakeley was now able to question Ngapatjukurrpa, (Rip van Winkle) regarding the location of waterholes and Aboriginal tribes in the vicinity. Blakeley was so impressed with Entata's command of Aboriginal languages, as well as English and German, learnt to fluency at Hermannsburg Lutheran Mission, that he made the pertinent observation that a man of his ability, "should be employed by the Crown as an interpreter in Aboriginal trials, then our natives would get a fair trial". Blakeley also learned that Entata was a very religious man and had a fine singing voice, and helped in clearing Illbilla airstrip for the Mackay expedition. Lasseter also made good use of Entata's knowledge and it is possible that the Pitjantjatjara to English dictionary at pages 4 and 5 of Lasseter's Diary was compiled with Entata's help. 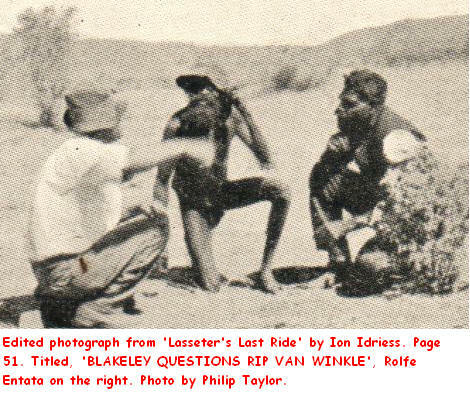 Lasseter and Johns left Illbilla on 15/09/30, heading south for the Petermann Ranges, but without Entata and his mate, they had cannily deduced that, "four men with five camels would mean two men walking all the time, and the natives knew who those two would be". The Aboriginals set off for Hermannsburg without food or water, confident their land would provide. Nevertheless Blakeley was troubled over their circumstances, but he was relived when Fred Colson reported next day, that he had met Entata and his mate fifty miles away, striding out, wearing just their boots and hats, splendid independence indeed. Coote also met Entata at this time and was most impressed with his abilities, noting that Entata was allowed to carry a rifle which was generally against the law of the day and, "he was not very friendly disposed towards Johns". Coote made a point of remembering Entata, "Rolfe was his name. I met him again. In fact I went looking for him". On 12/10/30 Coote arrived at Hermannsburg Mission and hired Entata to assist Philip Taylor and Paddy Tucker with the camel string carrying supplies to Ayers Rock where Coote intended to set up a base and search for Lasseter. Entata met Taylor and Tucker at Bob Buck's station, Middleton Ponds, and the four man team headed west, arriving at the 'Rock on 5/11/30. Taylor and Entata remained at Ayers Rock after Coote and Tucker departed, clearing an airstrip in anticipation of Coote's return. Disaster struck their camp on 8/11/30 when the highly inflammable windbreaks blew onto the camp fire and destroyed most of their equipment and supplies. According to Paddy Tucker Entata's tent and waterbag survived, "Taylor had nothing". their only recourse was to abandon the camp and head straight for Bob Buck's station with just one camel and a drum of water, "Like a good bushman, Rolfe just made a straight bee line for Bob Buck's, Taylor reckoned that Rolfe saved his life coming though that desert". When Idriess recorded the incident in Lasseter's Last Ride, where Rolfe is named Jacky, Idriess casts a slight on Entata's competence when it came to cleaning out an oil drum for carrying water on the trek east. The second day into the forced march Taylor tried the water and found it heavily contaminated with oil and undrinkable, "Oh Jacky, Jacky wailed Taylor. Why didn't I do it myself". Another myth surrounding the Lasseter saga, instigated by Idriess, has become firmly established in folklore. Apart from Taylor not being the 'wailing' type, Entata was quite aware of the need to clean fuel and oil drums thoroughly for water transport, having done the job many times at Hermannsburg during the recent prolonged drought. Taylor and Entata arrived at Hermannsburg on 18/11/30, none the worse for their long and difficult journey via Middleton Ponds. At the Mission, Taylor received instructions to carry on to Alice Springs immediately and make preparations prior to proceeding to Illbilla in anticipation of the arrival of Pittendrigh and Hamre on 20/12/30. Expecting difficult times ahead, Taylor wisely placed his Aboriginal companion on standby. Entata's next task was to retrieve the petrol from Bob Buck's station, the fuel having been returned there by Paddy Tucker from Ayers Rock. Entata was then to transport the fuel to Illbilla where he arrived without incident on 20/12/30, the day Pittendrigh and Hamre were due to land. Flight Lieutenant Eaton, in charge of the search for Pittendrigh and Hamre, interviewed Entata at Hermannsburg on 2/01/31 and he was able to give specific and valuable information. On 20/12/30 he had sighted the plane at about midday, "flying in a straight line towards Mt. Peculiar and Haasts Bluff from a spot situated some 12 miles S.E. of Illbilla and that on that day the wind there was from the S.E. and fairly strong". Influenced by Entata's information, Eaton and his companion searched the Haasts Bluff Dashwood Creek area thoroughly on 3/01/31. The missing fliers were located in the vicinity six days later, their rescue delayed by a week because they had failed to make any smoke signals or lay out ground signs. Pittendrigh later acknowledging that the R.A.A.F pilots had flown directly over their camp a week earlier. Entata set off for Hermannsburg the day after his arrival at Illbilla, in charge of more than twenty camels and the Aboriginal helpers Taylor had hired from the Mission, he arrived there safely the following week. Perhaps C.A.G.E. should have made a point of hiring Rolfe Entata in the early days of the expedition, thereby acquiring the services of a gifted interpreter, an experienced camel man and bushman, and perhaps most importantly, his understanding of the strange ways of the Whitefellow, all for five shillings a week and his keep. Several years later Entata displayed some of his, "splendid air of independence" when he refused to work for Patrol Officer Ted Strehlow for five shillings a week and more or less went on strike, perhaps one the earliest incidents of Aboriginal industrial action in central Australia. Rolfe Entata was born at Hermannsburg in 1906 and died in 1960, a tragic irony in that he perished from dehydration on Anna Creek Station, where Fred Blakeley had met Archie Giles in 1908. Apparently Entata and his four Aboriginal companions had used their entire water supply on the leaking radiator of their car. Entata is due recognition for his invaluable assistance to the first C.A.G.E. expedition, rescuing Taylor from a potentially dire situation at Ayers Rock, and his keen observations regarding the flight of Pittendrigh and Hamre. A good man to have on any expedition...at five shillings per week. Experience, common sense and dedication a bonus. Blakeley, Fred. Dream Millions. 113-117, 148, 157. Coote, Errol. Hell's Airport. 159,184, 226, 227, 235. Henson, Barbara. A Straight-out Man. 63, 104, 255. Idriess, Ion, L. Lasseter's Last Ride. 118-123. National Archives Australia. Title, Royal Australian Air Force, Report on Operations in Connection with the Search for and Finding Messrs Pittendrigh and Hamre in Central Australia. Series No. A9376, Control Symbol, 55. Barcode, 1102440. Pages, 9, 23. Scherer, P. A. Camel Treks in the Outback. 27, 28, 30, 36, 39. Scherer, P. A. Lasseter Demystified and Two German Rouseabouts. 17, 50.